"As the sun sets, the crescent of the new moon appears in the distance as this ancestral human creates his art, painting on the walls of the cave with colors drawn from Earth substances. The fire warms him; the cave shelters him and provides a refuge from the rest of the world. With its womb-like structure, it not only offers sanctuary but also serves as a temple that houses his creative spirit, which eventually gives 'birth' in the physical form of his artwork. There is a quiet, still place inside of you that will always be available as a sanctuary, yet finding such a space in the natural world will enhance and complement this internal place of peace. Whether it is a cave, meadow, forest, seashore, or any other settings in Nature, this is where you can see, hear, and feel the presence of the Creator in your surroundings. Let it become a temple for your heart and soul. Rather than having your computer, television, or any other human-made device or activity be your sanctuary, allow yourself to discover the perfect place in Nature where you can simply be and breathe. Doing so bridges the connection between the internal and external, facilitating a spiritual communion that allows your being to be aligned in dramatic and quiet reverie with All That Is. 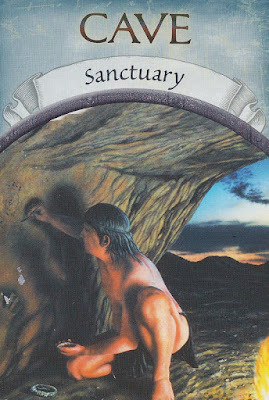 In today’s busy world, it becomes even more critical to set aside time for sanctuary-even if you have to schedule it!" Tämä kertoo osittain siitä, miten tärkeää on löytää oma pyhä paikka luonnosta, missä voi rauhoittua. Minulle se on ehdottomasti metsä, meri tai järvi. Jokin vesistö kuitenkin. Mikä sinun on?